Why professionally polish your natural stone? A stone floor, counter top, or other design element is a big investment. Stone is both durable and beautiful, and with the proper care and maintenance it’ll look like new for years to come. Stone polishing is an important part of that process. If you happen to be in New York a great place for stone polishing in NYC is Statewide Stone Care, they can provide you with the stone maintenance you need at a great deal. Stone polishing can spruce up floors or counter tops that are looking scratched, dirty, or dingy. Even regular cleaning and maintenance, as well as some chemical cleaners, can lead to dulled appearance of the stone over time. No matter what the problem might be, professional services at Statewide Stone Care can help make your natural stone look like new again! beautiful as the day it was installed. Best of all, the stone’s original gloss and sheen will be returned. You’ll also be able to get advice on maintenance for the future, so you can do everything possible to keep your newly polished stone looking beautiful for as long as possible. Different types of stone and different applications might require different types of polishing or have different results, which is why it’s always a good idea to work with a professional. For example, marble can receive a new matte or glossy polish that leaves it looking lustrous and luxurious. Stones like travertine might need holes filled or left unfilled, depending on the desired texture. Professional polishing always leads to a better effect, especially for especially hard stones like granite that have been damaged by harsh or acidic cleaners. When it comes to polishing your natural stone floors and counter stone polishing in NYC, and your natural stone will look like it’s brand new, even if it’s years old. For counter tops, a bottle of polish won’t be able to get the job done. 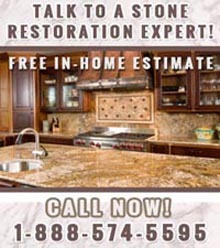 Hire Statewide Stone Care for all your stone care needs. Contact them at 1-888-574-5595.